Thank you for your interest in our music lessons! We offer large variety of one-on-one music lessons for children and adults: piano, voice, guitar, ukulele, banjo, violin, viola, cello, drums, woodwinds, brass, harmonica, mandolin, xylophone, dulcimer. We have over 20 music teachers with college degree in music and/or professional performance experience. Please, check out our teachers performances on our FaceBook page. WOC music teachers are dedicated to learning about your personal musical goals and helping you to achieve them. With at least three music teachers for every instrument, we are confident that we have the right teacher to meet your music lesson needs. Therefore in addition to their teaching credentials, our teachers have warm personalities, are extremely friendly and dedicated to teaching you the style of music that you want to learn in your music lesson. Our Receptionists are trained to provide the best customer service and can help you with lessons scheduling and can answer any questions you may have about our music school. They are patient, very friendly and yet professional. At our music school we offer 15 min or 30 min first initial lesson to see if you like it. You can keep trying different teachers/instruments until you find someone that you really like. Please, note that we never raise our price on a student. You always stay with the price you signed up with. There is NO contract and NO registration fee at our music school. Month to month payments (you will have the same day/time every week). Also we offer an options of doing lesson to lesson payment and scheduling. We like you to come because you are enjoying your lessons, not because your have to! 5. Lessons for Children of all ages. Piano and Violin Lessons for 3 year old! We teach student of all ages. We are the one of a few music schools in Jacksonville that starts teaching piano and violin to children of 3 years old. For that purpose we have instructors who have special education and training in children musicology and children development which allows them to teach very young children to play piano and violin. Because the basic principal of learning piano and violin at the early age is the same as learning your first language – children are engaged in games and exercises that keep them entertained and don’t realize that they are being taught through it.This way children will have this skill as a natural part of their development. With violin we also use advantages of Suzuki method mixed with traditional way of teaching reading the music. 30% of students at our music school are adults. We have very friendly and laid back atmosphere where student of any age can explore fun of learning music instrument or voice, get ready for an auditions, take music lessons as a hobby or relax from busy day and enjoy yourself by playing your favorite songs. 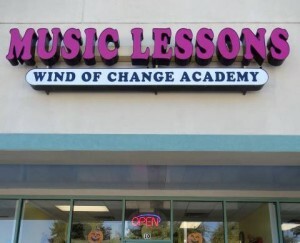 Wind of Change Academy has a long-standing reputation of excellence with long-term students and teachers. We’ve been in business since 2009. Therefore, please check out our FaceBook Page, Videos or You Tube Channel for our events’ pictures, videos and articles. We do NOT close for Summer and we KEEP our regular private lessons all year around. Recitals are great way of demonstrating students achievements. Plus – it is perfect self esteem boost for any child where students get to be the center of attention and receive positive feedback from the audience.